What is a coaching leadership style anyway? And, how is it linked to Primal leadership? 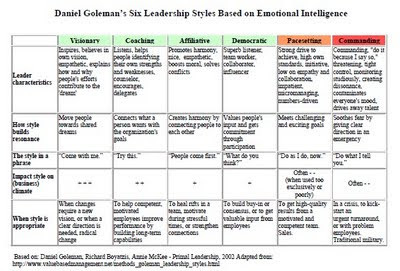 Daniel Goleman has defined six different leadership styles to chose from in any given situation. 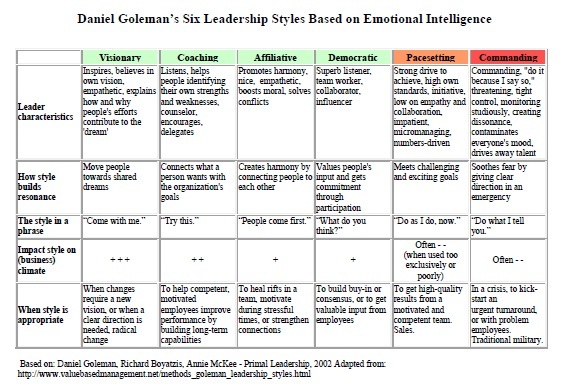 These six styles comes from Goleman´s work on emotional intelligence, which sets out the underlying competencies associated with successful leadership (see table below from unc-blog). Goleman encourages leaders "to view the styles as six golf clubs, with each one being used in a different situation." A coaching leadership style is appropriate "to help competent, motivated employees improve performance by building long-term capabilities. Leadership characteristics for this leadership style: "listens, helps people identifying their own strenghts and weaknesses, counselor, encourages, delegates. 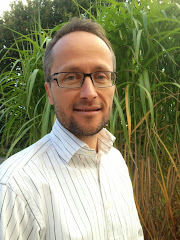 This style is successful because "it connects what a person wants with the organisation´s goals". 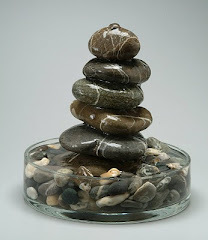 From the Wishful Thinking, creative coaching and training blog, I found a post about "Coaching and Leadership". Read it or beat it! A blog for inspiration with my humble reflections about leadership and effective communication - focusing on information, intuition, internet, psychology, happiness and exformation. Sometimes in Swedish, sometimes in English. Greta Thunberg - act right now! 3 Ways to Improve Your Cultural Fluency - Be curious and open to learning a new way of managing. My name is Mårten Hedin. Jag har sedan dryga tiotalet år tillbaka varit intresserad av ordet exformation, myntat av den danske filosofen Tor Nörretranders. I samband med att jag läste boken "Märk världen" igen sommaren 2009 så växte tanken fram att jag måste hitta ett sätt att förankra detta ord i det svenska språket. Därav denna blogg. Min bakgrund är skånsk, utbildningsmässigt är jag civilingenjör inom Datateknik med lite påbyggnad kring Historia&Psykologi, jobbmässigt är jag nu coach och managementkonsult efter att ha varit tjugo år inom IT/telekom-konsultbranschen där jag ca femton år haft olika ledarroller (senaste åren på Tieto). Ibland springer jag en runda, tar några slalomsvängar, läser en god bok, mediterar och njuter av mörk choklad.